I have been eating Locrio de Salami all of my life. In fact, whenever I’m working out and cut back on rice, Locrio de Salami is what I miss eating the most! I will sometimes plan my cheat days just so I can have this because I never eat just one bowl…. I practically eat the whole pot! You should see my mom and I go to town with this Locrio. We’ll park ourselves at the dinner and practically finish the whole batch all the while chit chatting about life. Interestingly enough, it wasn’t until I went to New Orleans and ate my heart out that I realized that Locrio de Salami is in fact a Dominican Jambalaya. Now there are many different Locrios the same there are many different Jambalayas. It all depends what meat you want to add. For example, you can have a Locrio de chuleta (rice with porkchops) or Locrio de Longaniza (rice with Hispanic sausage… another favorite!) 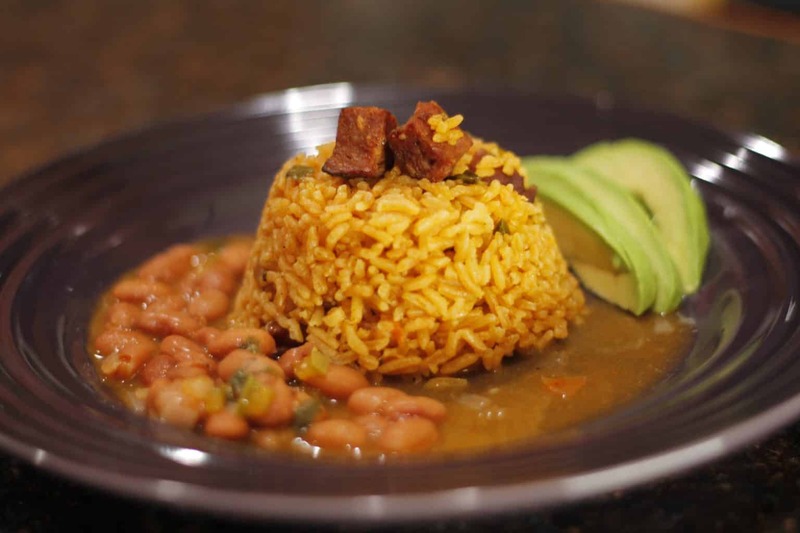 Locrio is a Hispanic dish that simply means rice cooked with meat not to be confused with a Moro which is rice cooked with beans. To start, cut your salami into 1 inch cubes and dice your onions and peppers. Warm up some olive or vegetable oil and add your salami. Once your rice is fully cooked, it’s time to eat! Serve with a simple salad, avocado, rice, and beans or you can it alone. Either way, it’s delicious! - I made 3 cups of rice which is a good amount of rice. Feel free to use less rice. Just remember that if you cook your rice the way that I do, that you should have a 1:1 ratio of rice vs. water. Therefore, for every cup of rice you cook, you should use 1 cup of water. - You can add some hot sauce to this dish and when taste phenomenal. If you want a spicy kick to this rice, add hot sauce or spicy means when you’re sautéing the salami and onions.